With just 55 days until the 2014 Daytona 500, what better time to take a closer look at the No. 55? The No. 55 has a colorful history in NASCAR, dating all the way back to 1949, the first year of the NASCAR Strictly Stock Series, which would evolve into what today is known as the NASCAR Sprint Cup Series. The first appearance of the No. 55 came in the third race of the 1949 Strictly Stock schedule. That’s when Glenn Dunaway drove his Oldsmobile to a third-place finish in a 180-mile race at Occoneechee Speedway in North Carolina. Dunaway’s big claim to fame was that he won the very first Strictly Stock race in Charlotte earlier that year, only to be disqualified because the car he drove, which was owned by moonshine runner Hubert Westmoreland, had illegal bootlegger springs in the back. All told, the No. 55 has competed in 968 races in NASCAR’s top division since ’49, with 13 victories, 19 poles, 91 top-five and 224 top-10 finishes. The most successful pilot of the No. 55 is NASCAR Hall of Fame owner/driver/legend Junior Johnson, who won five times in 42 starts in the No. 55. The only other driver with multiple victories in the No. 55 is Tiny Lund, who captured four wins behind the wheel. Four other drivers have one victory each in the No. 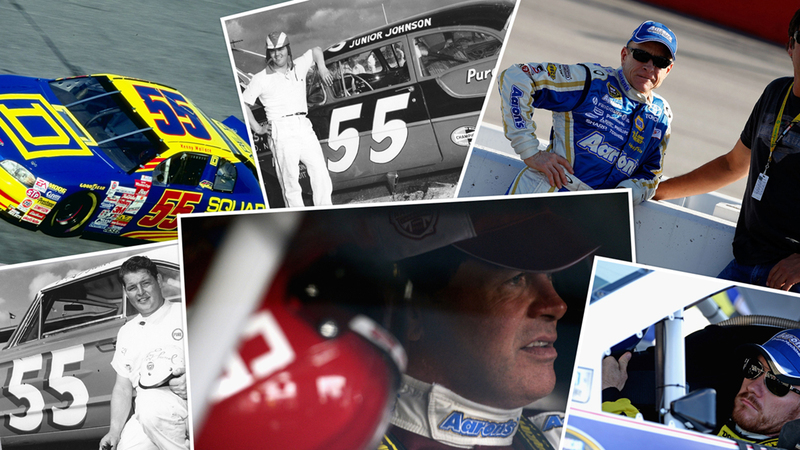 55: Phil and Benny Parsons, Bobby Hamilton and, most recently, Brian Vickers. The driver with the most starts in the No. 55 is Michael Waltrip, who had three top fives and nine top 10s in 126 races. Last but not least, other well-known drivers who ran at least once in the No. 55 include Buck Baker, Mark Martin, Kenny Wallace, Ted Musgrave, Greg Biffle, Fonty Flock and Wendell Scott.